At our Wakefield Carpet Shop we are pleased to present family owned Ulster carpets, founded in 1938 in Castleisland, County Armagh. With an ongoing commitment to maintain manufacture of their carpets in the UK rather than outsourcing, Ulster carpets recently completed a new dyehouse at Portadown, as well as an innovative energy centre to help them achieve their objective of becoming carbon neutral by 2020. With a wool processing centre in Dewsbury, West Yorkshire, dyeing, weaving and finishing at Castleislang and the Ulster design team based in Kidderminster, Ulster carpets spans the UK. Technological innovation aids with the depth of patterning that can be designed into carpet designs also, meaning that Ulster offers a substantial breadth to its designs within their carpet range. Ulster carpets aspires to excellence in all aspects of its business. Two of its most renowned collections are Glenavy and Glenmoy possessing traditional heritage of pattern and tartan sought after for the more classically styled interior. Blossom and Anatolia also are resonant of eras past, Sheridan Country House and Boho suiting an almost boutique hotel approach to interiors, comfortable, chic and classic. All can be used in heavy tread situations due to their 80%wool/20%nylon mix. Ulster claims minimum 50% renewable content with 25% recycled content in each of their carpet in their pledge to effect minimal impact on the environment. 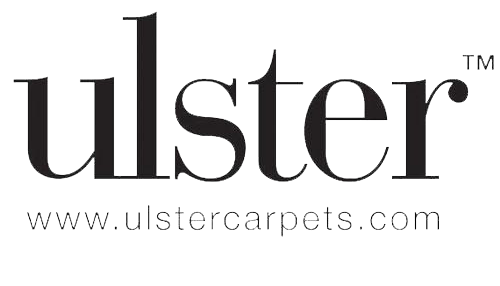 For commercial needs Ulster offers a bespoke service with over 75 years of experience in the carpet manufacturing business. Ulster uses PSYLO system weaving technology, creating depth of design in a carpet which takes design quality to the next level. Many prestigious commissions for commercial interiors have been undertaken by Ulster with their reputation for project management, innovative use of technology and high customer service levels. 70% of carpets can be found exported beyond the UK and Ireland, so sought after is the carpet product.